“Catch me if you can,” he seems to say. 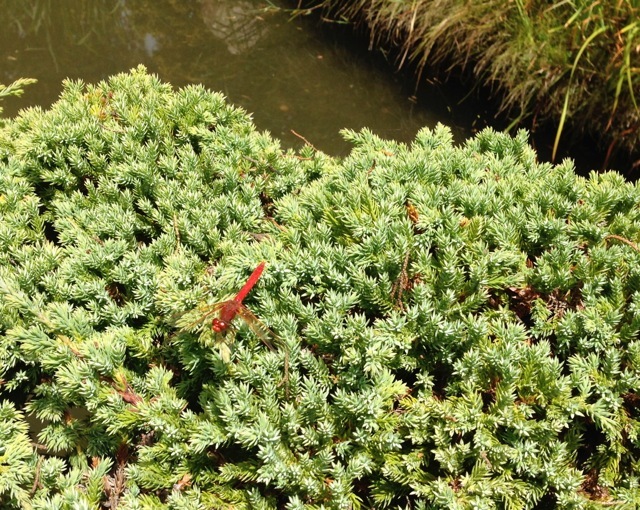 Note: This dragonfly was spotted in the Japanese Tea Garden in San Francisco, California. Best I can tell, he is a mature male Flame Skimmer dragonfly. He looks a lot like the European Red-Veined Darter or Nomad dragonfly. I have a Scarlet Cardinal living in my yard, and his black eyes often find me in my garden. This dragonfly reminded me of him, even when I was 3,000 miles from home. Sometimes cloudy days are the right days for photographing vibrant colors. Dragonflies are hard, though because they are so thin and almost transparent in the wing. He or she is so pretty! 🙂 As you probably know I love dragonflies. But I also love cardinals too. Do you have red dragonflies at home? No problem, I loved the photo and the poem! I’d never seen a red dragonfly before! He was red head to toe, and wings, too. He was vivid! WOW He’s a remarkable fellow 🙂 Lovely verse you’ve written for him ! !